I've made Ina's chocolate pudding with great success. But maybe there is room in my world for a second pudding recipe? I do lurv me some Scharffen Berger. Ali...this sounds so delish, i almost want to leave work to go make it! You're blogs are so inspiring!!! Thanks for being here babes! Wow, Ali, these look amazing and so, so yummy! If I close my eyes, I can almost feel the pudding hitting my tongue. I love this movie! It's so quirky and fun. Oh, and the pudding looks delicious, too! Thanks for following my blog, Ali! Margie - pudding is definitely a sensory food for me. The consistency was perfect. I wonder if I could freeze it and make pops? I've actually never seen this movie. I suppose maybe I should. I remember before Adam Sandler had done any big movies or anything, he put out a CD. I first heard Lunchlady Land on HFS when I was up way past my bedtime one night. Of course I had to have the CD. It had the explicit sticker on it so it took all kinds of planning. And then of course once it was owned it had to be kept secret from all authority figures... but man, all those fucks and shits and balls and dicks and penises and farts - it was all worth it. I knew then and there that this guy was gonna go far. Interesting. 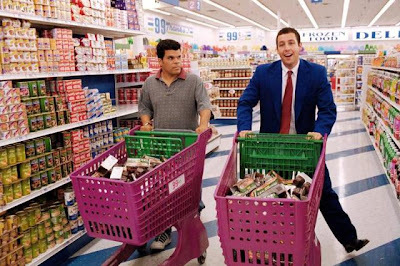 The pudding connection goes back even further..
ps i don't remember much about punch drunk love but i thought it was cute from what i do recall. Homemade chocolate pudding is always better then store brought. At least to me.